The Egyptian "crisis" is a very interesting situation to watch. While we have gone into other countries on the auspice of instilling "democracy" our largest ally in the region besides Israel has been headed by a dictatorial ruler. What we are witnessing in Egypt is a massive movement being pushed by a coalition of the Muslim Brotherhood a traditionally anti-western and anti-Israel organization and the liberal unionists trying to enact change. The biggest tip off to me, which made me side completely with the Egyptian people (and I believe the tipping point for most of the western world) was the closing of internet. Shutting down a huge means of conversation is just screaming dictatorial rule. No matter what you believe or what background you are coming from, this is a fact, it is the action of a government who doesn't want its citizens to freely express themselves. There are those, most who are already under the impression that Egypt, Jordan and Lebanon are controlled by Israel, who feel that the entirety of the Middle East will revolt including Israel and that these riots are showing their anger at Israel. Part two of this piece will go over the reasons behind this, but obviously they are wrong, if this has anything to do with Israel, it is a minimal spill over from the Muslim Brotherhood rhetoric. What is truly interesting here is the reaction from Egypt, Jordan, Syria and Palestine. This thing seems to have the potential to spread like honey through the land, depending on how hot things get it can be a quick spill or a cool crawl. This possible domino effect started with the toppling of an Arab dictator in Tunisia and issues starting up in neighboring Syria. Twitter and Facebook campaigns calling for protests have already taken over the net and one group has "called for a "day of rage" on Saturday, similar to the Jan. 25 demonstrations in Egypt that sparked the current uprising there. 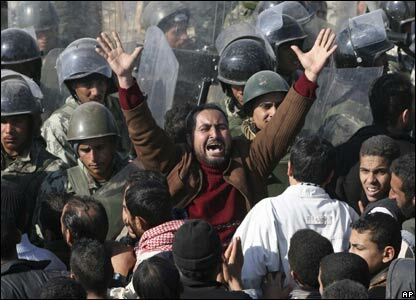 Another Web page with more than 6,000 members calls for protests in Damascus on Friday and Saturday." Jordan's King actually fired his entire cabinet which is not puzzling based on the fear of some sort of insurgency. The interesting thing here is that Jordan is rather progressive and westernized. Not only is the regency (including the lovely Queen Rania who is gorgeous, brilliant and an amazing humanitarian) progressive on women's rights and dealing with the West and Israel, they rate really low on human rights violations; lower than Mexico and only slightly higher than the United States where Egypt is considered one of the top 20 offenders. Alarmed by the popular uprisings in Tunisia and Egypt, the Palestinian Authority has finally agreed to hold local elections. In the West Bank, the Palestinian Authority agreed to hold local elections for the first time since they were cancelled in 2006 and were supposed to take place last June. But the PA controlled West Bank is very different from the Hamas controlled Gaza Strip who have "denounced the idea, asserting that the PA does not have the right to call for such elections." This is a slightly scary situation for Israel since instability has a tendency to be bad for neighboring countries. The IDF has been keeping a “watchful” eye on the West Bank. This is mainly out of concern that Palestinians will launch demonstrations similar to the ones in Egypt. This instability will make it easier for terrorist groups will try to launch attacks against Israel, which is focused on Egypt. While in other countries many are watching with satisfaction at what looks to be possibly the imminent toppling of a regime that denied its citizens their basic rights, the Israeli point of view is completely different. The collapse of the old regime in Cairo, if it takes place, will have a massive effect, mainly negative, on Israel's position in the region. In the long run, it could put the peace treaties with Egypt and Jordan in danger, the largest strategic assets after the support of the United States. Allow the United States and even Israel to push the brotherhood out of the leadership and give the power to more leftist union leaders and other political options, separating themselves from previous regimes. If we look at who is rioting we see that; "the formation of young rebellious groups of students and intellectuals from outside the traditional partisan framework of the opposition, which was granted some margins of freedom by the regime in the last few years in order to contain popular anger." The political message is about oppression, the economic is about food and jobs. Spin the message so that the people will not stand for replacing one form of oppression with that of religious oppression and that the United States is not the same one that supplied Egypt with tear gas canisters but we are now the friendlier, more supportive America of hope and change. Israel can show that they are not to be feared or hated, but can help the people of Egypt and even the Palestinians shirk off the oppressive and corrupt regimes that don't really care about their people. That is really just my two cents for now, watch out for part two and three of this analysis on the Egyptian situation.